A new range of high performance seating components based on the original and highly regarded Q-care cushion. Now released in two different styles and with an option of two different choices to suit your clients needs: low-medium risk/comfort with posture control, and medium-high risk with posture control. 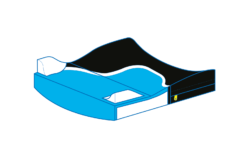 The expansion of the Original Q-care concept where adduction and abduction could be added, omitted or adjusted where necessary and includes versions to cover lower risk categories (low and medium) while still providing the same degree of lateral support and the option of including either abduction or adduction by way of a Velcro fastening system as the original. The new addition to the Q-care range known as the “Q-care Integra” again covers the three main categories of risk, (low-medium-high) but includes or integrates adduction and abduction as standard. The new Integra 1 has all the control of the higher performing Integra 2 but uses high quality foams used for their reliability, comfort and durability with pressure distribution gained through the reﬂex shaping of the product, posture control is to the same standard as Integra 2. The Integra 2 takes the initial concept to the next level by installing one of the highest performing memory foams available, Sunmate, located in the seating well. 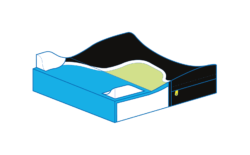 Further protecting the very sensitive and prone areas such as the I.T’s while maintaining supreme comfort and lightness in weight. All common standard sizes are available (15”x16”, 16”x16”, 17”x17”, 18”x16”, 18”x17” and 18”x18”). Most custom or special sizes along with individual client needs are readily available. 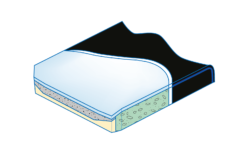 1) (Q-care Integra 2 is 1 1/2lbs per square inch) at 50% deﬂection or compression.